This article first appeared in The Edge Financial Daily, on November 27, 2017. KUALA LUMPUR: Malaysia needs to focus on retaining women in the workplace to address the relatively low level of female participation in the labour force, said experts. This is because a significant portion of women workers in the country leave their job when they start a family, and thereafter do not return to the workforce. There is thus a need for a clear framework on how to retain women in the workforce, providing among others more flexibility and longer maternity leave for them, said the experts, pointing out that a higher level of women participation in the labour force will boost the country’s economy. “Other than increasing productivity through the increase in labour supply, having more women in the workplace also increases household income,” said Affin Hwang Investment Bank Bhd chief economist Alan Tan. “The increase in income would increase consumption and purchasing power of households, which will contribute to a stronger economy,” Tan told The Edge Financial Daily. Unicef Malaysia’s deputy representative and senior policy specialist, Dr Amjad Rabi, said earlier this year that Malaysia could counter a reduction in labour supply caused by demographic changes, by ensuring that female labour force participation increases to its potential. “Malaysia is currently one of the lowest in terms of its female labour force participation in the region and in comparison with countries at the same level of economic development,” Rabi said. Latest data by the statistics department shows that the labour force participation rate of women is 54.6%. Malaysia’s current labour force figure stands at 15 million. Anne Abraham, founder and chief executive officer of LeadWomen Sdn Bhd, said Malaysia still has a very dynamic and young female workforce. “Based on the Labour Force Survey Report, more than 55% of the female labour participation rate comes from the age group of 25 to 54 years old. The highest age group of women in the workforce is between 25 and 34 years old,” she noted. 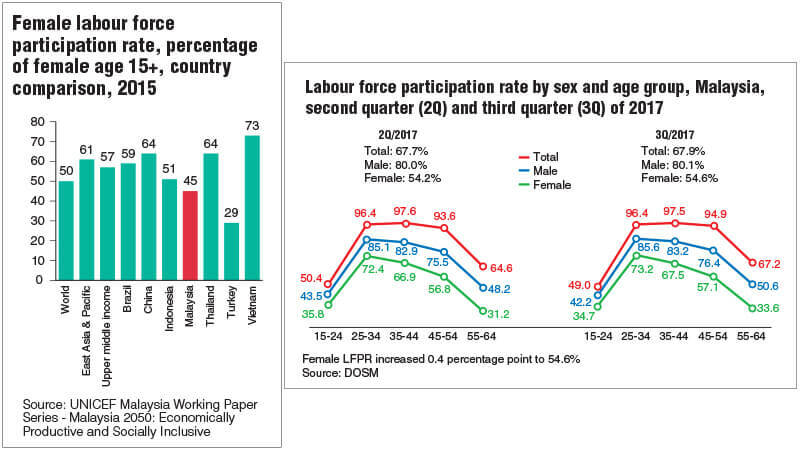 Khazanah Research Institute (KRI) noted in its State of Household II report last year that the labour participation profile for Malaysian women by age did not display a “double peak”. What this means is that women’s labour force participation peaks between the ages of 25 and 29, coinciding with the age around which women usually bear children, after which it declines and does not rise again. One reason for this, said KRI, is that a large number of women leave the labour force due to housework, implying that the main impediment for women’s participation in the labour force is domestic responsibilities associated with starting families. According to KRI, the World Bank estimates that the number of “absent women” — women who can be expected to be in the labour market given Malaysia’s level of development but are not — ranges from 500,000 to 2.3 million. Offering a similar view, Anne cited a research by Talent Corp-ACCA which saw Malaysia as one of the countries where women leave their job and do not return to the workforce. The survey entitled “Retaining Women in the Workplace” indicates that “93% of those surveyed want to return to the workplace but around 63% found it difficult to do so”. “Many are preoccupied with having and raising a family, caring for the disabled and other family-related issues … some also feel the stigma when they have taken a hiatus from work; they are deemed less committed,” she said. Another challenge to promote female participation in the labour force is the perception that gender diversity comes at the expense of meritocracy, according to the Boston Consulting Group’s (BCG) recent report on gender diversity in Southeast Asia. This concern was most often heard in Malaysia and Indonesia, which are also the least advanced in promoting gender diversity in the region. “Gender diversity interventions have to be designed in a way that does not give the appearance that women have been promoted unfairly. Transparency is key,” said BCG. It added that supporting women at moments of truth (instances where employers are tested by women’s need for flexibility in work due to pregnancy or family commitments), building an environment where women feel supported and developing role models are key. Datin Nancy Sim, former human resource head with Great Eastern Life Assurance (M) Bhd and an independent director with public listed companies in Malaysia, agreed and said that a clear framework on how to retain women in the workforce needs to be designed. Maternity leave is also another crucial aspect, she said, noting that some organisations have agreed to provide three months’ maternity leave. “The Singapore civil service sector has now improved on its maternity leave by providing additional leave of up to six months called the caregiving gap. Having a first child and working with a lack of parental and domestic support can be a traumatic experience for young mothers,” Sim said. The government, when presenting Budget 2018 last month, proposed that the private sector increase the mandatory maternity leave from the current 60 days to 90 days, as practised by public-sector organisations. However, not all parties are on board to provide more flexibility or longer maternity leave for mothers. The Malaysian Employers Federation (MEF) has said that increasing maternity leave to 90 days will lead to an estimated RM747 million increase in cost per year to employers. “Employers need to also pay for the cost of replacement that would also amount to about RM747 million, thus amounting to a total of about RM1.5 billion per year,” MEF executive director Datuk Shamsuddin Bardan said in a statement after the Budget 2018 announcement. Sim agreed that a longer maternity leave will result in additional cost for employers but said companies that are focused on keeping talent will implement it and eventually benefit from the skills and talents of its employees. “Initially, some companies might not be open to it but eventually, organisations that have good performance management systems will be able to retain the best talent and enjoy the return on investment,” she said. Johnson & Johnson Sdn Bhd head of human resource Sharon Foo said it is possible for both multinational firms and small and medium enterprises to provide additional maternity benefits despite the additional cost. Her company, she said, provides an additional 26 working days of maternity leave on top of the mandatory 60 days, as well as eight weeks of paternity leave. “When we take care of our employees’ well-being such as through sufficient maternity and paternity leave, we see an improvement in the productivity level of our employees … we also see higher retention of our talents, especially the younger families,” said Foo. On how the smaller companies could cope with the additional cost from providing additional maternity benefits, Foo said the companies need to plan on a longer-term basis. “The company might want to restructure their recruitment and hiring process to have more singles and elderly people if they want to introduce such benefits. When they have a workforce at the right balance and quantum, they could do so,” she added. MEF pointed out that in some countries such as Singapore, Thailand, the Philippines, South Korea, Australia, France, Sweden and Norway, the wage during maternity leave is paid wholly or partly by the government, social security or insurance. “Compared to other countries, employers in Malaysia are already very generous as they pay the wages in full for the 60 days’ maternity leave,” Shamsuddin added. According to him, the government should share the cost with the employers. “Employers are already stretched in that the number of working days for an employee in Malaysia is already quite low and one day’s wage in the private sector is estimated at RM600 million. An average of 250,000 women employees go on maternity leave each year,” he said. Shamsuddin said while MEF supports women in employment, to require an employer to bear an additional cost of 30 days’ maternity leave would be unfair in view of the challenging economic environment and implementation of other new policies, such as the Employment Insurance Scheme, expansion of SOCSO coverage and minimum wage. Sim agreed that the government has to play a bigger role to encourage female contribution to the economy. “The government can play a very integral role by inviting women to take part in open tenders and offering grants for all the government-related type of projects. We may need to look at the procurement policies to ensure that they are inclusive on all aspects, including gender. This way, they can create our own woman crowd sourcing hub and retain some of our best ideas locally,” she added. Women’s Aid Organisation (WAO), the non-profit group that provides counselling and shelter for abused women and their children, said the share of women in vulnerable employment, based on studies by the Penang Institute, increased from 34% to 44%, between 2011 and 2015. WAO communications officer Tan Heang-Lee said the share of women in vulnerable employment has increased more rapidly than men, and thus there is a need for policies and programmes to improve women’s economic security. “Women also bear the lion’s share of unpaid caregiving work, which hinders them from participating in paid work. Malaysia’s female labour force participation rate is at 54.3% (compared to 80.2% for men), which is among the lowest in Asean. “We need policies to make childcare more affordable and accessible. Additionally, we need men to share the burden of domestic and caregiving work. Flexible work arrangements also create an enabling environment for both men and women, which could increase labour force participation,” Tan said. LeadWomen has just organised an event last Friday, titled "The ASEAN Women of Tomorrow Conference 2017", to talk about the disruptive trends of the new economy and how the next generation of women leaders would face some the challenges in the new economy.